18 V CORDLESS HYDRAULIC CRIMPING TOOL | Tallman Equipment Co., Inc. 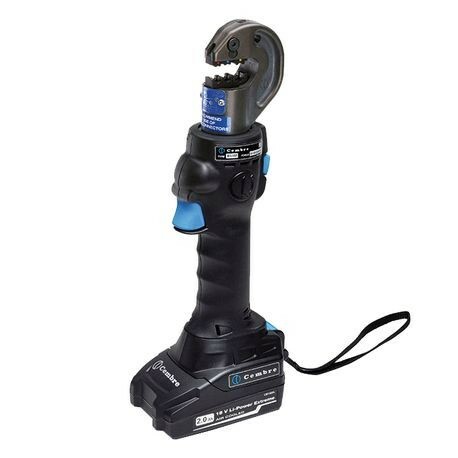 The B15MA can be operated with one hand this tool is ideal for crimping #22 - #6 insulated terminals. The head rotates by 340° for ease of operation in confined spaces. The tool is fitted with a maximum pressure valve. Extremely quiet, minimal vibration. Durable moulded body offering high resistance to wear and damage in all operating conditions. New Li-Ion 18V 2Ah High Power battery. The battery is equipped with led indicators that indicate the remaining battery life at any time by pressing the adjacent button. Supplied in a robust plastic case to accommodate the tool and all the accessories. Two batteries and AC charger (110-115V) included. Many different interchangeable crimping dies available. Operating temperature: +5 to +122°F. Kit includes: Tool, (2) 18 V Lithium-ion Metabo batteries, strap, AC charger, and case.